Summertime is vacation time for people, not plants! While getting ready for that long awaited trip, it’s easy to forget about your lawn, landscape, vegetable garden and house plants. A little time spent preparing your leafy friends for your absence could save you needless worry and hours of extra work when you get back. Prepare your landscape for your absence. A vacation may be relaxing and rejuvenating for you and your family, but it can be hazardous, even deadly, for your plants. Unless you make adequate preparations before leaving, you could return to vegetable disaster. One of the first things you might do before leaving home is ask a neighbor to check your plants periodically while you’re gone. All plants need some care. During an extended vacation container grown plants require special attention and different species have different needs. Be sure you give your friend specific instructions for the care of each type. If you can’t find someone to personally look after your plants while you’re away, there’s plenty you can do prior to departure to make sure you don’t come home to a limp landscape and sickly house plants. Outdoor container plants should be placed in a shady area to conserve moisture. Under a tree or on the north side of a building are good locations. 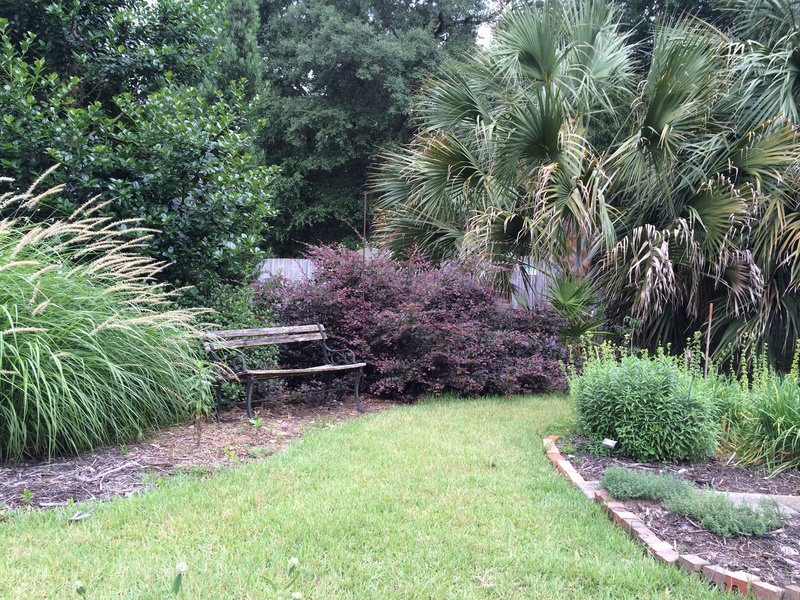 A thick layer of mulch will help conserve moisture for landscape plantings. Mow your lawn just before leaving, cutting the grass a little closer than usual. An unkept lawn can encourage disease, and it’s a tell-tale sign that no one’s home. Give lawn and landscape plants a heavy watering – especially recently planted beds, which will need extra moisture. Also, thoroughly spray or dust your plants to protect them from insects and diseases while you’re away. If you have flowering annuals, cut the blossoms before departing. If you don’t, they’ll soon stop blooming. Harvest all ripe or nearly ripe fruits and vegetables. Like flowers, they will continue to produce only if they’re picked frequently. Otherwise, they’ll go to seed. Do a thorough job of weeding. If weeds are allowed to go to seed while you’re away, you can expect to encounter much more difficult problems later in the season – even next year – when the seeds sprout. Weeding eliminates a major source of competition for your landscape plants’ food and water which may be in short supply during your absence. Plants kept indoors require special consideration. Before leaving home, place your house plants in a room which receives indirect sunlight. Direct exposure to the sun will dry the soil too quickly. Of course, you don’t want to put your plants in a room that’s too dark, either. Too little light will almost always result in leaf drop. And, just before you depart, be sure to water your house plants thoroughly. 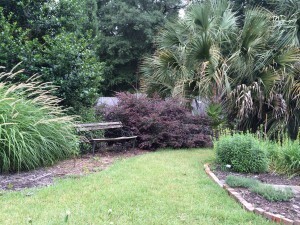 This is especially vital, because – unlike lawn grass and landscape ornamentals – house plants cannot benefit from any rain that may fall while you’re gone. You’ll enjoy your vacation more by making sure your plants are well prepared for your absence. In our area of Florida, soils will vary in the amount of nutrients they hold. In general, we think of our soils as nutrient poor because sand is often the highest component. Sandy soils have large pore spaces and the particles themselves do not ‘attract’ many of our nutrients. Therefore needed plant nutrients can leave a sandy soil quickly, especially when rainfall or irrigation is prevalent. There are areas along the Panhandle that do have more quality soils that have the ability to retain some nutrients. Also, frequent fertilizer or lime applications in home landscapes can create soils with abundance of certain nutrients over time . One nutrient that may become prevalent in routinely fertilized soils is phosphorus. We know that phosphorus is one of the big three nutrients needed by plants in order to grow and flourish. When we routinely apply phosphorus to garden beds or lawns, it can build up. Phosphorus is a nutrient that does not leave the soil as readily as other nutrients. It binds to other elements to hang around. If we keep adding phosphorus to the soil, even though there is plenty there, problems can occur. One negative impact is the potential for soils with phosphorus to wash away and pollute local water systems. Phosphorus is absolutely necessary for plant growth. It is needed for the energy transfer which is involved in plant growth functions. Phosphorus is also important for flower and fruit formation, and root growth. There can be too much of a good thing. The key to remember, as with any nutrient, is make sure it is needed before applying it to your soil. Plant growth will not be improved beyond what is normal by adding more of any nutrient. Before you grab the bloom promoter or starter fertilizer with high phosphorus, run a soil test to accurately determine what is really needed in your soil. Since the heavy flooding in late April of this year, many property owners have expressed concern to me and their local government officials about their neighborhood’s vulnerability to flooding. Homes and landscapes are most people’s largest investment, and the damage caused by a major storm can be financially and emotionally devastating. To say that Florida is prone to flood is an understatement, at best. 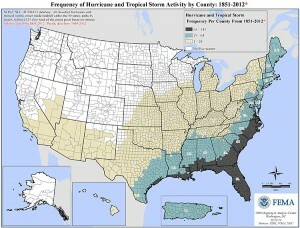 Between 1851 and 2012, every county in our state endured between 65 and 141 tropical storms and hurricanes. Many counties average one named storm every 1.1 years. While other states have coastal regions vulnerable to hurricanes, the entire state of Florida lies within FEMA’s highest designation of storm frequency. With hurricane season just beginning and record-breaking flood events in April, it is wise to consider flood insurance. Regular homeowners’ insurance policies do not cover damage related to flooding. Many homeowners go without flood insurance because their home is “high and dry” or “not in a flood zone.” It can be argued, however, that as a Floridian, particularly one in a region of the state with the highest annual average rainfall, you’re in a flood zone—it’s just a matter of whether you’re high or low risk. And, as we’ve seen recently, even those who thought they were low risk could be vulnerable. Flood insurance is often very inexpensive for those outside of officially designated Special Flood Hazard Areas (think waterfront homes, low-lying property, creek floodplains, and barrier islands). Rates can be as low as $130/year for basic coverage in a low-risk area. It’s simple to get a ballpark figure for potential flood insurance costs by entering your address into a one-step “risk profile” online. According to the National Flood Insurance Program’s (NFIP) website, a quarter of NFIP flood insurance claims and third of Federal Disaster Assistance each year goes to residents outside a mapped high-risk flood zone . When the expenses related to flooding, including removal of flooring, walls, furniture, and damage to plumbing and wiring, are taken into consideration, flood insurance can be a smart investment. Timing is important, too, because a 30-day waiting period is often required before flood insurance coverage kicks in. If you are also looking at additional windstorm insurance, be aware that policies will not be sold if a storm is in the Gulf. It is important to act sooner than later, but if you start now you can have flood and windstorm coverage in place before August and September. Our most severe storms historically occur during these months, after the Gulf has had all summer to warm up. To purchase flood insurance, contact your local agent, find an agent online at www.floodsmart.gov, or call 1-888-379-9531. Be sure to ask exactly what is covered and under what circumstances, as there are many particularities to flood insurance. For up-to-date information on recent changes to the NFIP, please visit Coastal Planning Specialist Thomas Ruppert’s webpage. Disclosure: The University of Florida/IFAS Extension program cannot make specific recommendations on insurance agents or providers. Please make the best decision for your home and family to prepare for storms and flooding. They are planthoppers (Metcalfa pruinosa), an insect in the order Hemiptera. The common name for this woolly looking planthopper is the citrus flatid planthopper (CFP). As the name implies, they occur on citrus but can also be found on many woody ornamentals and fruit trees. 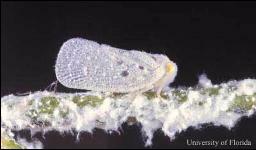 The adult planthopper wing arrangement is tent-like, meaning that the forewings are held over the insect abdomen in a tent configuration. The nymph, young immature insect, produces the white woolly material that is characteristic of CFP. 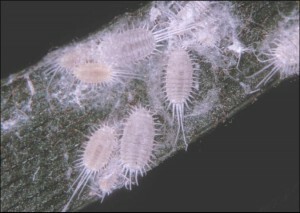 At first sight, they can be mistaken for mealy bugs, which may look similar since they are covered with cottony white filaments. They can also be mistaken for cottony cushion scale. 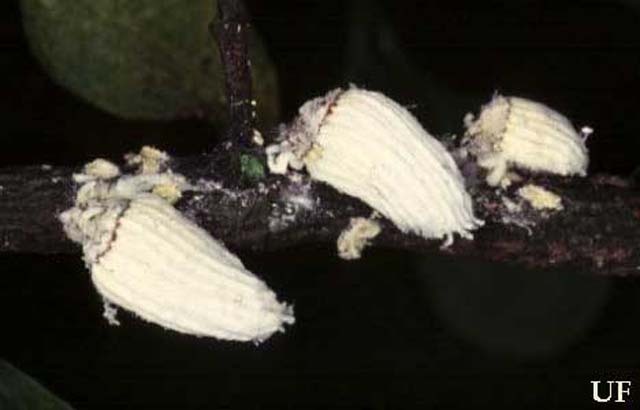 Cottony cushion scales, Icerya purchasi, on twig. In both of these cases of mistaken identities, the insect will not jump or hop around. No chemical control is necessary although sooty mold can occur on heavily populated plants. In that case, a soapy water treatment can be applied. 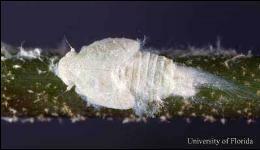 Follow these links to more information on the citrus flatid planthopper, mealy bugs, and cottony-cushion scale. Orange flowers and purple fruits often occur on Purple Sunset pomegranate at the same time, producing a colorful display. Photo by Gary Know, UF IFAS. Purple Sunset is a new ornamental cultivar of pomegranate, Punica granatum. Purple Sunset pomegranate is distinguished from fruiting pomegranate by a bushy, compact habit and numerous flowers followed by small, ornamental, purple-black fruit. Native to southeastern Europe and Asia, pomegranate has long been grown for its edible fruits. 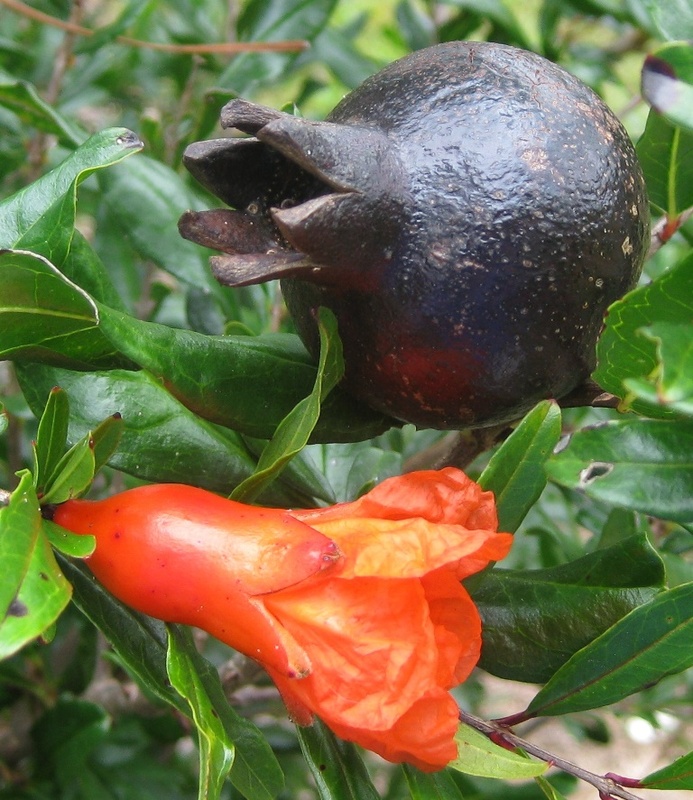 Horticulturists recently recognized its ornamental qualities and began selecting pomegranate for form, flowering, and ornamental fruits. ‘PIIPG-1’ is a cultivar selected from open-pollinated seeds of Punica granatum ‘Nana’. Trademarked as Purple Sunset, this cultivar has a bushy, compact growth habit. 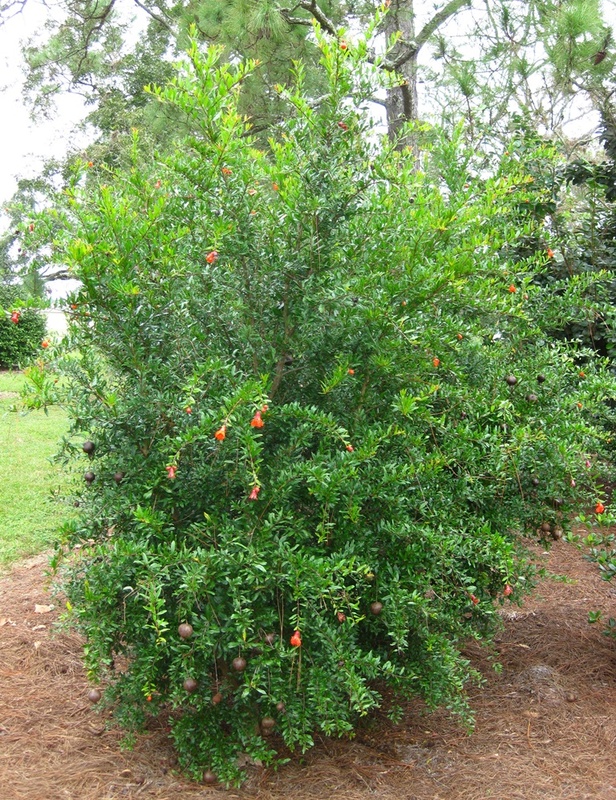 Although promoted as a dwarf form that grows only 3–4 feet, plants in north Florida (USDA Cold Hardiness Zone 8b) have grown significantly larger, approaching 6 feet in height 3 years after planting. Purple Sunset pomegranate may be used in the landscape as a specimen plant or hedge. Leaves of new growth are red-tinged, becoming glossy green throughout summer, and turning yellow to yellow-green in late fall before dropping in early winter. Large two-inch orange flowers occur on new growth throughout summer and fall. The orange flowers develop into inedible, shiny, purple-black fruit up to three inches in diameter. Orange flowers and purple fruits often occur on the plant at the same time, producing a colorful display. Fruits persist into winter, adding interest to the leafless shrub, before eventually falling. Wildlife may eat the tough, seedy fruits, but this has not been documented. Purple Sunset pomegranate in North Florida. Photo by Gary Knox, UF IFAS. Culture of Purple Sunset pomegranate is similar to fruiting pomegranate. 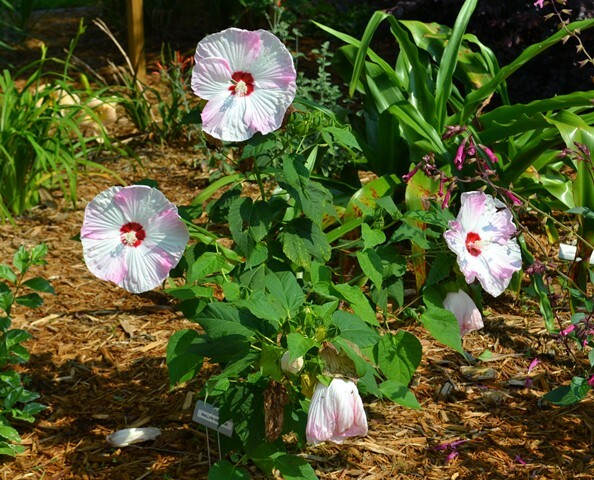 This plant is hardy in USDA Cold Hardiness Zones 7–10. It grows best in full sun to part shade on deep, loamy soils but is adapted to all but alkaline soils. 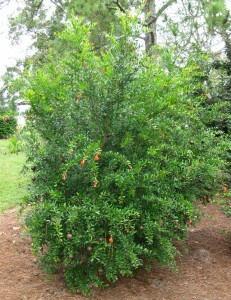 Pomegranate is somewhat drought tolerant once established. Hedged plants should be pruned in late winter before new spring growth. Leaf spot and fruit blotch, diseases of fruiting pomegranate, may also affect Purple Sunset, but these problems have not been noted in the landscape.